The main theme was written by Thomas Newman. Thomas Montgomery Newman (born October 20, 1955) is an American composer and conductor best known for his many film scores. Newman has received a total of eleven Academy Award nominations, although as of 2013, he has yet to win the award. He has however won two BAFTAs, five Grammys and an Emmy, and has been nominated for a Golden Globe. Newman was honored with the Richard Kirk award at the 2000 BMI Film and TV Awards. The award is given annually to a composer who has made significant contributions to film and television music. The Newsroom is an American drama television series created and principally written by Aaron Sorkin that premiered on HBO on June 24, 2012. The series chronicles the behind-the-scenes events at the fictional Atlantis Cable News (ACN) channel. It features an ensemble cast including Jeff Daniels as anchor Will McAvoy, who, together with his staff set out to put on a news show "in the face of corporate and commercial obstacles and their own personal entanglements." Other cast members include Emily Mortimer, John Gallagher, Jr., Alison Pill, Thomas Sadoski, Dev Patel, Olivia Munn, and Sam Waterston. Sorkin, who created the Emmy Award-winning political drama The West Wing, had reportedly been developing a cable-news-centered TV drama since 2009. After months of negotiations, premium cable network HBO ordered a pilot in January 2011 and then a full series in September that year. Sorkin did his research for the series by observing several real-world cable news programs firsthand. He serves as executive producer, along with Scott Rudin and Alan Poul. 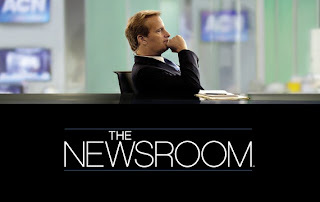 The Newsroom has been renewed for a second season, which will premiere in June 2013. There is a fascinating monologue given by the main character in the video clip "America is not the greatest country anymore". Click through to my blog Aaron Sorkin: The Newsroom for both the video and a transcript. It is a must see.